Most classical guitar pieces are played in either an arpeggio style or a contrapuntal style. To play classical guitar in arpeggio style, you hold chords with the left hand while plucking the strings in succession with your right hand (so that each string rings out and sustains). Usually, you simultaneously play a melody on the top strings (using rest strokes) over the arpeggios. The following figure shows an exercise in arpeggio style. Play the first note of each measure and the notes with stems that point down in the standard notation with the thumb; the other notes you play with the fingers (i on the 3rd string, m on the 2nd, and a on the 1st). 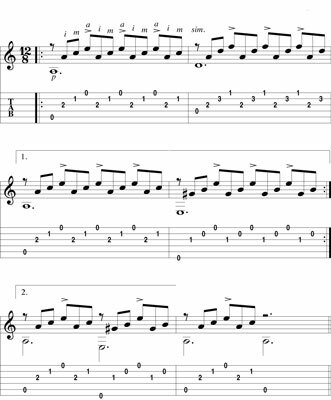 The notes that you play on the 1st string have an accent mark (>) over them in standard notation, indicating that you should play those notes louder. In other words, use the more powerful rest stroke for accented notes and free strokes for all other notes. Remember to hold down all the notes of each measure simultaneously with the left hand for the duration of the measure. Before combining rest strokes and free strokes, play this exercise using all free strokes to get the feel of the piece. After you’re comfortable with it, add the rest strokes to the notes on the 1st string.